We vacated earlier this month to Topsail, NC. It was our first time there and we will definitely return in the future. It was absolutely beautiful and the most low-key, family oriented beach I believe we’ve ever been to. The weather couldn’t have been better, the time with Family was wonderful, and since my brother-in-law did all the cooking, I actually woke up to the smell of bacon and sausage on more than one occasion. We’re already counting down the weeks until next year. I found the best swimsuit on Amazon before we headed to the beach. A friend from church recommended the brand Free Country and it worked out perfectly. As a side note, I did lose my Kate Spade sunglasses in the ocean when a wave attacked me. I have read a few books since I last shared my reading list. Gabriel’s Inferno was pretty good, but way too long. I couldn’t bare to continue the series. I read Still Me to finish off the Me Before You trilogy. It was enjoyable, but didn’t really measure up to the first. Although, I did love wrapping up her life and seeing where she ended up. Big Little Lies was my beach read of choice. Loved it!! Highly recommend. Not often does a book throw me for such a loop that I burst out loud with an “oh my goodness” and startle the life out of my Farmer. I just finished The Girl You Left Behind. I did like this book, but it wasn’t my favorite. I kind of lost patience in getting to the end. Up next is All We Ever Wanted and In Flight. What have you been reading? As I mentioned earlier, work happened. It’s been super busy for the last few months. It’s a good thing I love what I do and thrive off of times such as this. Budgeting is not for the weary! Things should return to normalcy soon and for that I am thankful. There has been a small but impactful development at the office... We got a new ice machine and it’s the little pellet ice. I can’t stop eating it. This should be good for my weight, right? I can snack on ice instead of chocolate. Can we talk about how my garden exploded while we were on vacay? Corn, beans and tomatoes oh my! A recent storm did do some damage to some of our corn, but I think it will straighten back up on its own. I’m pretty proud of these tomatoes too. My Farmer and I started a new show. If you’ve been reading for any length of time, you know my tv time is limited. I prefer sleep and reading. However, he insisted I watch Yellowstone with him. I’m a sucker for Kevin Costner so I agreed, and now I’m hooked. I could do without the language, but other than that, I’m intrigued. I think about the family logistics long after the show ends. It’s kind of like a Dallas meets Bonanza. Anyone else watching it? VBS was last week and my Middle and Oldest Little Farmers loved it. I dropped them off and took the Littlest Farmer home. My Farmer and I were so pleased to hear so many good compliments about how well they behaved and that my Oldest was such an awesome big brother. Melt my heart! 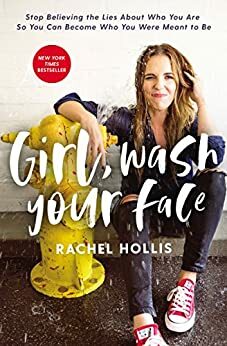 Have you heard of Rachel Hollis? A friend from work introduced her new book to me and I cannot wait to read it - Girl, Wash Your Face. Did I mention my Littlest Farmer is a certified chunk and is on the verge of walking at any moment? He’s such a happy baby and has every single person in our family wrapped around his little finger. School is right around the corner and my Oldest will be going into 2nd grade. I’m looking forward to our annual school supply shopping trip. Well, I think that’s a fairly random and extensive download. If you’re still reading, you’re probably more patient than I am. Ha! Our weekend is set to be amazing assuming all goes according to plan. I’m vacating from work today and spending it with my forever friend. She and I are going shopping and eating scrumptious food. And then the family and I will be heading to the local fair on Saturday where my Oldest Little Farmer hopes to win the Mutton Bustin’ contest. After that, we’ll stick around for the rodeo. I very much hope this is the start to regular posting again. I hope your Friday’s are fabulous! Have you watched Longmire? My farmer and I watched that all..it's on Netflix. We are going to start Yellowstone this weekend I think. Woohoo for garden tomatoes! Happy Friday! I have Girl Wash Your Face on hold at the library. Just waiting for it to come in. Your beach vacation sounds wonderful! We watched Ferdinand and my kids enjoyed it too. I enjoyed Still Me and seeing how the series wrapped up and I also liked The Girl You Left Behind. All We Ever Wanted is on my to read list. Have a great weekend! Oh, that beach is so beautiful! I've been to Outer Banks in NC. Is Topsail close?I'm horrible at directions/geography haha! Wow, your tomatoes are gorgeous! I would so love to get into gardening! Have a great weekend! That beach looks so beautiful! I'm so jealous! My mom lives in South Carolina, and both North and South Carolina have some really gorgeous beaches! Gosh, your beach vacation just sounds wonderful! We just moved to Virginia and have heard the beaches in NC are really nice. And it sure sounds like you have some fun weekend plans! So jealous of your beach vacation! Living in Wyoming means we are FAR from a beach! ;-) I'm fascinated with Yellowstone, Kevin Costner, the scenery and your description of it being a mix between Dallas and Bonanza is perfect. Like another comment mentioned I think you and your Farmer would like Longmire too. So glad you found time to post! Have a great weekend. I have heard sooo many great things about Girl Wash Your Face. I sooo want to read it. That vacation life looks like amazing life. Ha. Yes to those tomatoes. WE haven't gotten many yet.